I am born and bought up in Mumbai. At the age of 33, for the first time I visited Girgaum Chowpatty on the eve of Anant Chaturdashi, and I discovered a new meaning in the process of Visarjan. To the world the relevance is that Visarjan is when Lord Ganesha leaves for Kailasha and takes the misfortunes of his devotees along with him. To me, it appeared as something bigger, something more magnificent. I and my family chose to park our car at a distance and walk the streets to witness Visarjan. I was a part of a stream of people, belonging to different castes, each with unique physical attributes and of course from different financial statuses. But, there at that point all were together, in one flow. Visarjan unites…. All were walking, all pedestrians – no two wheeler, no cars, no rickshaws, only feet to feet. No inhibitions about heat distance and fatigue. Visarjan made us ecofriendly at least temporarily…..
A love story to my credit…. Attempted for Write India a contest held by the Times Of India to encourage literary work of naive writers…. Though i did not win i accomplished a sense that i can write stories too…. It would be a stress buster so read on……… Click on the link below..
No why, no what, no anxiety, no how?? I wondered, does everyone has a similar story to share? 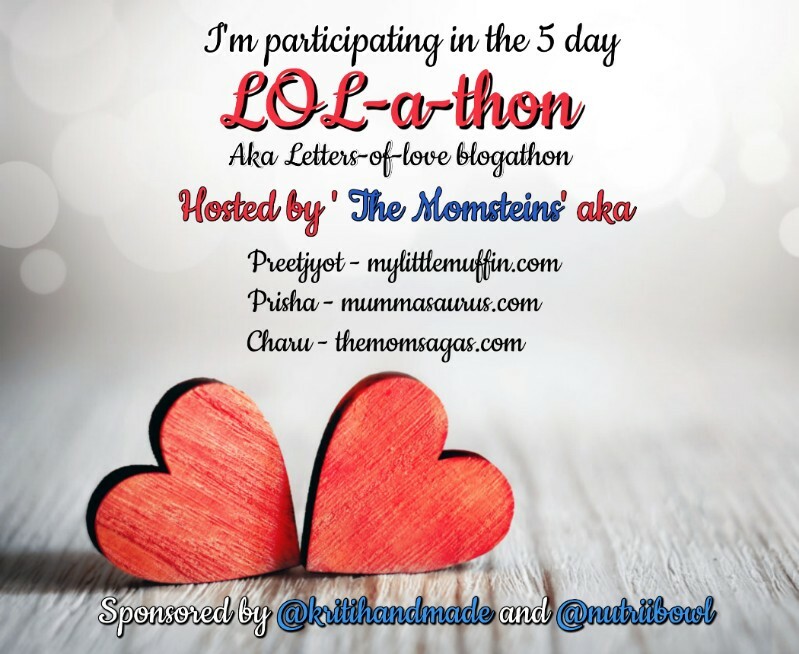 I’m thrilled to be participating in a five day ‘LOL-a-thon’ organized by ‘The Momsteins’. Join us to read some wonderful letters written by 26 cool bloggers. Stay around to read some amazing letters coming up. How should I start? And where should I end? You are a part of me so it actually feels that I am talking to myself. After spending 10 years with you, I have come to understand that we are actually like parallel tracks, we will always run in the same direction and never meet. Before you get skeptical about why I am being so curt? Let me tell you why I believe so. We both are so sincere towards our work and self -growth that it always assumes priority over each other. Well that is not indicative of us not being connected; rather it is a symbol of our love and affection. Your dedication makes you attractive and my interest in day to day work makes me compatible. We have seen many twists and turns of life, and stood head strong. What was different was your sheer acceptance and you, thinking what next? Nothing could hold you or tie you. You made me move on and out of rough situations. There are many things that are common between us – to name the two, our taste in shopping and desserts. Oh such a sweet tooth we have. But I have noticed every time I go on a ‘No sweet post 5pm’ diet regime, even your interest in bed time sweets declines. See those are the vibes of togetherness. I know it sounds small, but small is indeed beautiful. Your eyes seek me, when we are out shopping; somehow you trust my say completely. I feel so special on those days!! I know its small but again small is beautiful. Your white lies, they are so irritating and with what confidence you tell them. Let me tell you I can catch you red handed every time you do that but I choose not to, to avoid getting into a bitter fight over petty childlike lies. So whenever our kids lie I unintentionally consider it as your genetic contribution. My imaginary future has many scenes especially the one where we travel and travel till we get lost. I imagine the latter half of my life in a peaceful second home where there is ample room for creative lethargy. Vague dreams where I see you cook, we doing ballet, me learning to play the guitar…. Which are distant from reality as of today; fill me with positive enthusiasm about our life in the years to come. Despite your rigid routine, you know why and how I knit thoughts like a maverick? Because you belong to the herd that welcomes a change with open arms be it technology or lifestyle. Though you keep yourself away from small talk and arguments when there is a need for you to take a stand, you are like some hero from the film who has the guts to rise against whoever is in front be it family, friends or society in general. Your otherwise peaceful stance gets dim and you turn aggressive to opine and opine strong. This is one unique quality, which makes you my special man. I would like to thank Mohita for introducing me. You can read her post here http://mommaloveskabir.blogspot.in. I would also like to introduce my fellow blogger Neha Mani Mishra, you can read her wonderful post on the prompt here bloggifiedmom@wordpress.com . I have always loved myself so writing a letter to self looks easy to me. How are you? And how am I the Neha today treating you? I know you know that I am still you. The same Neha who first stepped into her MBA college, the same Neha who made her first presentation and the same Neha who got the best campus offer. Yes, I am referring to you, a 20 year old Neha. You were an achiever and you enjoyed your share of limelight be it academics or extra -curricular events and activities. Your command on time and self- management was something to look up to. Your mind was set, to take up only that which you can do the best. What language and what speech? You were proud of yourself. Fellow friends and teachers were always in appreciation. Why am I talking college alone? Because that’s where you spent 10-12 hours learning, enjoying, competing, supporting and most importantly dreaming. I am sure you must not have forgotten the conservative air in which you breathe then? Judgments and restrictions were a part of the smallest of the activities in day to day life. Part of a joint Marwari family and eldest in a group of 4 sisters, you were expected to be the light bearer and not the path breaker. Seemed unfair then, but today when I have my own family I appreciate the intentions if not the ways. How backwardly orthodox it sounded? But do you realize that, that one truth released your mind of all the self- inhibitions. It never let self -complex issues even touch you. That straightforwardness and guts have stayed, maybe that’s the reason I am penning our life so openly. About the lighter moments all I gather is your innocence and penchant for writing. All those lectures that could not retain your attention were spent in scribbling stories. Fictional, factual and incidental your last pages were always full of your wandering thoughts. In fact that was one reason why others were attracted towards you. The ability to express and be original, and trust me Neha, I am still the same. Even today I wish to be naïve as it is indeed blissful. That is one part of you that I am losing on, but will not let it go so easily as my peace of mind, my deep sleep lies there. I read The Secret twice in the last 5 years, and I connected that I had lived it when I was you. The I-pod, The White Skoda, The freedom to just be, A house with a night view, An understanding husband, A supportive family after marriage……. They were your vibes right? You set the frequency, and the Universe responded. Today I have it all and much more that you dreamt off. Love you, and I don’t miss you because I am still the same. Today’s prompt is Letter to Neighbors. I feel strange as I write this letter because I never really felt the need to be so expressive towards you, Uncle and Aunty. For me it was always enough to show respect by regularly communicating by coming to your place. However this letter urges me to delve deeper into our occasional yet regular relationship. When I enter you house, whenever I look at you both all I can sense is contentment – one word that summarizes your lifestyle for me. You live in complete acceptance of the present, and that is what I love about you. Your house is always well lit with natural sunshine and I find it windy even in summers because you keep the windows open. Small things about your place or my neighborhood as I can call it reflect the poise – the simple minimalistic furniture, the bread butter that lie on your 4 seat dining table always, the swing in the balcony, the essential stationery on the side table and so on. As I write all this I realize how much I know about you people. My children Jia and Yuvaan, have grew up as much under your guidance and supervisions as much under ours. ‘Aunty House’ and ‘Baba House’ is what they call your place. One thing that is eternally blissful is your open doors and open arms for them. They enter your house with such authority, which has been possible only because of your unconditional warmth. I came face to face with my emotions towards you both, your house, when you visited US for over 2 months. The deserted alley, the darkness on one side and the closed doors, made us miss you every single day. I still remember the way Jia rejoiced when she heard you had come back. It would be mean to not mention Neha and Pallavi, who never stepped back even in your absence. Just like you they greeted children and me and offered to let them stay, even while they were occupied with their own commitments. It is rightly said that children become what they see. ‘Neha Didi’ and ‘Pallo Didi’ is what my children call them and they have played elder protective sisters quite well. Any reader might wonder that because it’s an open letter I am not sharing my bitter experiences – but because I write heartfelt, genuinely I had nothing sour to share. Yes, this letter oozes sweetness, courteousness and respect but that’s how it is!! Blessed to have such wonderful neighbors, I raise a toast to you!! Today’s prompt is Letter to an inanimate object. I did not take much time in choosing you as the receiver of this letter. I took to walking around 18 years back when I was studying. The habit was instilled in me, by my Grandpa. His constant take was – ‘Jo Sota Hain Who Khota Hain’ – ‘The one who keeps sleeping, loses.’ I got accustomed to this routine of waking up early and going for a refreshing walk almost every day. I bought you from the mall, but you have bought me up the ladder of self- healing and health. If I am down with the intention of a workout, I can’t walk even 100 meters without you. You have been my support system as I have put you on every time, every single morning and we tread along. You are with me during the best part of my day when I plan and ponder, remember and forget, cherish and regret the time behind and the time yet to come. You have seen me through rough days, where I just left home wearing you, seeking answers, walking fast and furious. You never gave in till I found what I was looking for. Then there have been days when I have been hyper energetic on my fitness goals and walked a few extra kilometers, though weary, you stood beside me. I remember, once a part of you got slightly damaged. Yes, it was completely repairable, though not so urgent; I took you to the cobbler immediately, because I could not tolerate anything happening to you. You must be seeing your fellows, worn out and hassled, but for me your shine and maintenance is important, because you play a vital role in my mental and physical well being. I have seen all the seasons with you, the summer sweat, the winter chill and the soothing rains. I have climbed the mountains as I trekked with you and also ran the extra mile. You have also eavesdropped on the occasional lost minded gossip that I have engaged in post the walk. You have your own friends in the shoe rack, but I bet you enjoy my company the most. They do not get out as regularly as you do, except the little school shoes, with whom I think even you might be having generation gap issues. The stylish ones wait for party invites, the colored ones wait for the right outfit to be worn, the daily pairs are disheveled buying essentials and seeing kids cycle. You seem to be the luckiest as you move out in the shining sun or late in the night when the mesmerizing moon stares at you. I understand with passing time, I have changed shoes, there were a few before you and there will be many after you. But what is real, is the present. Fading away is a part of life but what matters is your aura while you are functional or existent. You, in particular my Blue Sketchers, are very dear to me as I find you very comfortable and stylish. I take pride in the fact, that I wear you each day with consistent energy. You are an integral part of my fitness regime that defines me. This letter is my tribute to all the happy and troubled times that we have spent together. Love you!! Thank you for being my positive companion. I would like to thank Aashi for introducing me. You can read her post here http://lawyermumma.wordpress.com. I would also like to introduce my fellow blogger Preetjyot Kaur, you can read her wonderful post on the prompt here http://mylittlemuffin.com . Today’s prompt is Letter to kids. You two are way too young to read and understand this letter. But for me it is a chance, to share my journey playing mommy to you. Whenever you read this, I know you would agree that your mommy belongs to the preemptive mommy category. A perfectionist by nature, which meant trouble for you guys. Let me tell you that from the moment I conceived I started preparing for being a good mommy mentor. I enrolled for parenting classes, filled my pockets with confidence in handling children and delivered you, my lovely daughter – Jia. You came out with eyes shining bright and eagerly looking around. We could not believe that a just born is so reactive but that was you (now 7 years). Now if I were to share Yuvaan’s birth story – Oh God!! I get jitters. To everyone’s surprise he came out on his own, right outside the labor room. He was born meek, but was strong enough to push himself out and yes I am not exaggerating. This is how you entered my life little Yuvaan (now 3 years). Interesting right? To know, how you were when I first saw you, when I first held you in my arms and yes my eyes are moist. Since then there has been no looking back. Now, after a little bit of history I wish to dedicate this letter to 10 things that I have learnt from the both of you, yes, what I have learnt and not what I have taught you. 1 – Jia, you had this typical habit of falling asleep while you are playing. One moment you are actively rolling in your play gym and the next moment you are peacefully sleeping. You taught me that it is ok to rest in the middle of something. You only recoup to live better. 2 – Jia and Yuvaan your eyes mirror your inside. They are gleaming all the time, with a tinge of wonder. I find them so pretty that I try to keep my eyes as bright and as widely open as possible. I feel they spill positive enthusiasm all over. 3 – Yuvi, you are a regular problem child as you suffered from wheezing every time there was a climate change. You are just 3 as I write this letter and you have four hospital admissions to your credit. But I salute your spirit my superman, in the poorest of health conditions, you chose to smile and sleep. You never made my life difficult and cooperated throughout the IV’s, injections, tests, medications. I cried, but you taught me to smile. I was disheartened but you taught me to keep faith. I got anxious about what is coming but you taught me Hakuna Matata – No worries, this too shall pass. You are my tiny soldier and through this letter I pay my tribute. 4 – Yuvaan, you are persistent in your request for anything. Polite and continuous, you convince me to give what you want. Jia got 7 gifts on her birthday a few days back. Of all, you chose one puzzle pouch, distinctly not age appropriate for you. You coaxed me for 5 full days, but with such courtesy and assurance that you will not damage it that I had to give in. I learnt rudeness or roughness never pays, soft tone and a smile work the best. 5 – Class monitor and a favourite with kids, Jia you are a star. You showed me, that one should live the moment. Today, you are shining, use what you have, about tomorrow we will see. Let not humility steal the charm of stardom. No, I don’t mean to say you are a snob, but you are thoroughly enjoying your status. 7 – Jia you have this habit of asking your best pals in school whether they will invite you for their birthday parties. They agree and you come home and ask me to check my Whatsapp for an invite. Even after I refuse, irritated because there is no invite, you still keep double checking. You know why? Because somehow you trust your friends completely. No one to blame, even we did not invite all to our parties. I find you too cute in those moments, and yes I share your disappointment and feel like calling their mommies right away and telling them that my Jiu is coming to the party. 8 – Yuvaan, you are the thief when it comes to desserts and chocolates. It is unethical on your part to eat them hiding, but I came terms with the fact that harmless tini- mini lies sometimes adds fun to our otherwise monotonous life. 9 – Importance of repetitions and routine, yes I understood it from the two of you. Both of you have heard the same Goldilocks story for about 100 times and the level of excitement to go to the same park every day is unhampered and the same every single evening. I realized that whenever time or space does not permit, some different experience, cherishing the routine ones is not a bad idea. 10 – As I am raising you two, I have come face to face with the power of self -empowerment. The more I rely on self the better I get, be it sports training you both, making you study or multi- tasking to balance you two, house and my own passion. You have introduced me to my potential. I am a good mother because you are good children. I see a bright future with the two of you. Love you Jia and Yuvaan, for teaching me all the right things. I am excited for the years to come.